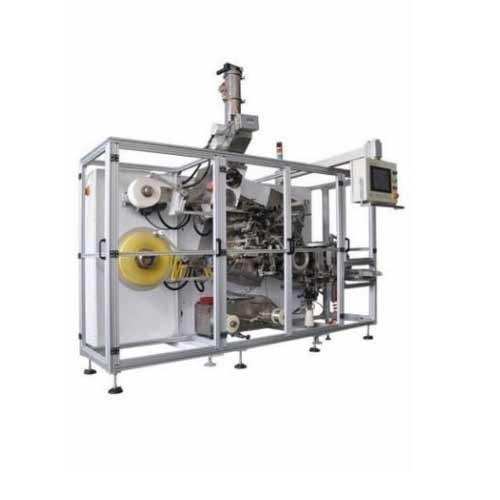 We are leading manufacturer and exporter of Fully Automatic Double Chamber Tea Bag Packaging Machine and our product is made up of good quality. Owing to the rich industrial base, we are engaged in offering Packaging Machine. The offered machine is a kind of automatic tea bag machine for the packing of tea and similar herbs. This machine makes double chamber tea bags which are cold-sealed. Our machine links up hard label and thread with staple, and the teabags are pushed out and packed into box manually after counting. The packing materials used in these machines are non-heat seal filter paper, label, thread and staple. Weilai Machinery, LLP is a specialist and technology partnership firm for plant and equipment and related services for processing basic foods and manufacturing advanced material. From the year 2011, we are manufacturing, supplying and exporting a wide range of Packaging Machine, Flour Mill Machine and many more. We also provide Repairing Service, Installation Service and others. These products and services are provided by us to clients as per their requirements. The core technologies of the Group are in the field of mechanical and Image process engineering. With its expertise and over 15 years of experience, Weilai Machinery rolls out unique and innovative solutions for its customers, helping them achieve success in the marketplace. Over the decades, Weilai Machinery has come to be acknowledged as a reliable partner, thanks to its distinct commitment to quality and its global presence. Weilai Machinery Group operates in over 40 countries and is still growing. Our major markets are Nepal, Myanmar, Bhutan, Bangladesh, Sri Lanka, European and African countries.